Would you say that you feel stressed about work projects, money, taking care of your spouse, parents, or kids, all the household chores that have to be done, getting the body you want, & finding the time to do ALL of these things? Great! Welcome to the club called HUMAN, and guess what…no one gets out ALIVE or STRESS FREE! In fact, I have bad news, you won’t ever be able to eliminate stress or completely avoid it. Last week, I found myself tempted and distracted by every thing imaginable. I was craving chocolate, chips, frozen yogurt, and other fatty,fast foods. Not too mention, I felt tired, exhausted, & unable to think clearly or focus! Just straight up BLAH! Now, because I have a Fitbit, I can track my average sleep over a week’s time, and what I found was that I had averaged 5.5 hours sleep/night during that week. I need between 6.5 – 7 to even feel like a normal human being. Looking back, no wonder I felt like I did, and my cravings for junk food were up. Lack of proper sleep causes stress in the body, and naturally reduces our willpower. It’s our willpower that really helps us to stick to our long term goals and stay focused, when what we really want to do is take the quick fix and feel better in the moment. When we don’t get at least 7-8 hours of sleep/night, we can anticipate that our stress hormones are up, as well as, our cravings for the foods that will make us feel better in the moment, but not the long term. It makes sense to want to feel relief from stress, but junk food isn’t the answer either. If you find yourself experiencing an increase in cravings, feel out of control, or are indulging in junk food to cope with stressful feelings, how much sleep you’re getting per night is a great place to start monitoring. If you’re getting less than 6 hours/night, work on nothing else, but getting closer to 7 hours/night. After doing this consistently for a week or 2, see if your cravings are more manageable. Now, some of you may be thinking, but I just can’t get that much sleep, so is there no hope for me! Not at all! Here’s some other steps on how to view and manage your stress better, even if you fall short on sleep. I’ve started to view stress as a positive thing, since reading the book by Kelly McGonigal, “The Upside of Stress”, because it means I’m learning, growing, and improving. I’ve done this through changing my relationship to stress by accepting, embracing, and managing it better. “How do I do this?,” you might ask. Well, I can tell you that food and alcohol aren’t the answer. #beentheredonethat They give temporary relief in the moment, but no one ever says, “I’m so glad I ate a whole box of twinkles or drank 2 bottles of wine last night,” the day after using food/alcohol to deal with problems or stress. If anything, they cause more stress the next day. What could you do instead, the next time you find yourself going for the quick fix and feel yourself self- soothing with food or alcohol, even though you’ll resist doing it at first? I will tell you from personal experience that taking leisure walks and meditating for ONLY 5 minutes daily have been two big game changers for me and managing my stress over the last 6-8 months. I’ve felt more relaxed, creative, in control of my cravings, and productive then I ever have. These are the only two things that I have added, and I definitely don’t have less stress than I did a year ago, and maybe actually more. 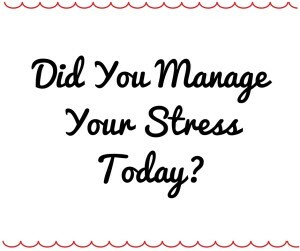 What are you going to do differently to manage your stress today so that you feel happier and more in control? Let me know in the comments below.